The location is rigged over a few hectic hours. Each team – cameras, lighting, vision, sound and video tape engineers work together to ensure that the technology they are responsible for is installed in the correct location and is in working order. Because they are taking part in a reenactment using old equipment which has not been used for some years, they face an extra challenge. There are more serious and more frequent equipment failures than would be expected on a real outside broadcast assignment, and repairing or replacing equipment is far more difficult. 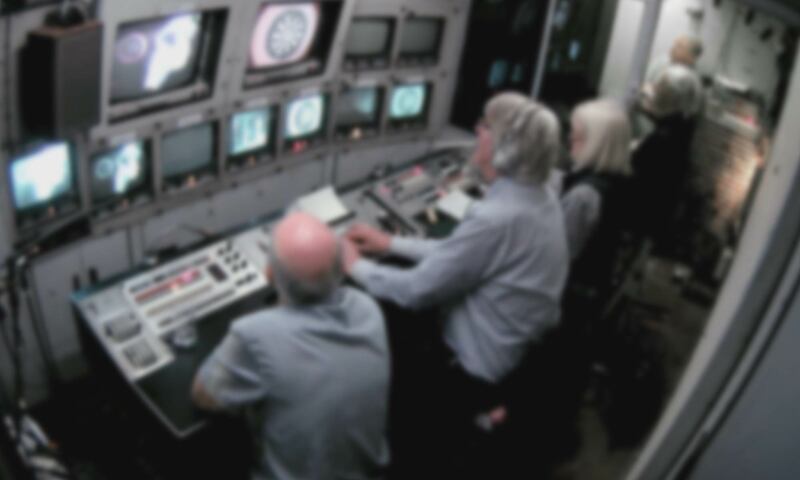 As they start to position the equipment across the space, the team tests the initial pictures transmitted from the cameras and to the monitors in North 3. The problems begin when the team discovers an issues with the coder: the device that picks up the red/blue/green signal from the camera and turns it into a single-wire feed in PAL. As they bring in the equipment, the director brief the team members on the positioning of the equipment according to his own vision of the scenes to be filmed. “Can I touch it?” Director Geoff Wilson takes his seat in North 3 to begin testing the vision mixer. While many functions are working correctly, some are not, and he must prepare to work around the restored system’s limitations. As they position the cameras and the rest of the equipment in the room, the team discover that one of the cameras isn’t working. A camera viewfinder which was initially working correctly has now failed after sitting under the warm studio lights. In the meantime, director tests the order and working condition of the cameras. While the cameras are being positioned, the team also scatter and attach the microphones around the space. Although normally they would use a ECM 50 microphone, for the purpose of the reenactment they use an ECM 77, a model developed after the 1970s. In the meantime, the rest of the team play and record the broadcast music. With communications between the set and the truck now robust, sound engineers test the audio and visual links between the commentator, John Gwynne, and the director Geoff Wilson. After the difficulties of the first day are finally resolved, the team returns for the second day of the simulation looking forward to a less stressful experience.